Wellness is the new black in hotel amenities. After a flight your mind may be raring to go but your body may be holding you back. The effects of being up in the air include sore necks, stiff backs, swollen legs and don’t even mention ankles. 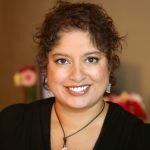 Inactivity and dehydration take their toll. Despite constantly sipping water and rotating your ankles to alleviate the symptoms, you’re just not feeling like you want to jump into your next adventure. But the remedy may be as easy as check-in. At Fairmont Vancouver Airport hotel, keeping fit while flying is integral to the hotel’s hospitality philosophy. Water, fresh fruit, running routes and cycling maps are on offer in the lobby (bikes are available for guests) and there are wellness options at the hotel’s Globe YVR Restaurant. At the property’s Absolute Spa, the Jet Lag Recovery Anti-Swelling Leg Treatment uses a pink grapefruit, juniper berry and rosemary massage oil to encourage circulation and prevent deep vein thrombosis, while the deep tissue massage techniques get rid of those flight kinks. In room wellness options include a Saje diffuser with aromatherapy oil, workout clothes, shoes and yoga mat plus a DIY Kerstin Florian product kit to send you into dreamland. 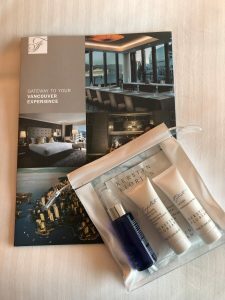 Non-guests can benefit from Fairmont Vancouver Airport’s health options with Fit on the Fly program passes. The platinum pass includes access to the fitness and wellness rooms, workout gear and shoes loan, and even a healthy meal to take on your flight. 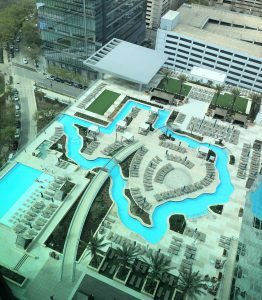 As a guest of the Marriott Marquis Hotel Houston you can begin to reduce post-travel stress immediately after check-in with a float on the Texas-shaped lazy river pool, daily yoga overlooking Discovery Green Park, a water aerobics class or a consult with a personal trainer in the fitness center. All of the hotel’s workout options are found on the expansive pool deck adjacent to the 5,000-square-foot Pure Spa, a spacious wellness retreat in shades of pale gray, cream and white. Choose face and body treatments from the spa’s Pure Investment Guide, such as the Customized Touch Destress Massage that targets specific areas to insure travel strains and stiffness are replaced with a rejuvenated body ready to explore America’s fourth largest city. You can also request in-room treatments for the ultimate in indulgence. Historic El Embajador, a Royal Hideaway Hotel, may be best known as the A-list hotel locals love for celebrations in Santo Domingo, but it can also be a place to recoup with a wellness mini-break. 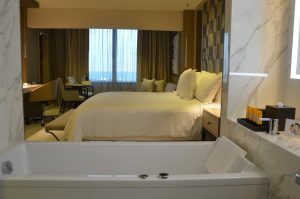 Royal Level guests receive a Bi Wellness & Spa Jet Lag Recovery Kit that includes a salt soak to help you relax post-flight in the spacious bathtubs—a welcome addition to recent room renovations—and refreshing aloe vera gel to massage into skin to soothe and hydrate you from head to toe. With lush gardens throughout the resort you can stroll beneath the trees, spend time at the popular swimming pool or the two-story spa with fitness center and yoga platform. Book an afternoon of treatments meant to eradicate stress and jet lag: Bi body scrub, lymphatic body wrap, hydrating facial, deep tissue massage, and a dip in the plunge pool—a blissful way to experience me time.